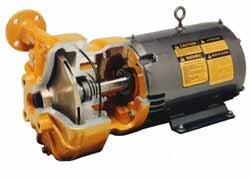 � End suction centrifugal pumps, JM frame (3-15 HP). � Applications: Compact close coupled electric motor driven centrifugal pumps. Rugged cast iron casings with bronze or cast iron impellers.